In Brazilian jiu jitsu, you learn how to fight, imposing your will on another person to prevent them doing the same to you. It is less confrontational than MMA (a closely related sport), where you're also getting punched in the face, but physical combat is still at the core of BJJ. Sparring for the first time can be an intimidating experience: most beginners will panic. Depending on their size, they will be struggling wildly to escape with all their strength, or looking to crush their opponent with superior mass. Either way, they are probably going to be aggressive. Personally, I have an automatic aversion to the term ‘aggression’. For me, it conjures up images of shaven-headed thugs with bulging neck veins getting into fights outside pubs. I prefer the term ‘assertive’, which doesn’t have those associations. It may merely be a matter of semantics (as Leslie discusses), but it nevertheless makes me wonder why people like me have that reaction to ‘aggression’, particularly in the context of BJJ. After all, the legendary Aleksandr Karelin put it to good use in the picture above. Part of the reason is the fondly held myth of the slightly-built martial arts superhero, gracefully dispatching a horde of less enlightened meatheads. The weedy nerd within us all (or rather less deeply buried, in my case) wants to believe that pure technique will trump brute strength, requiring no physical effort or malicious intentions on our part. BJJ has several diminutive superheroes of its own, beginning with Hélio Gracie. The Gracie patriarch was allegedly so frail and weak he had to learn his impressive fighting prowess through observation (I have my doubts). 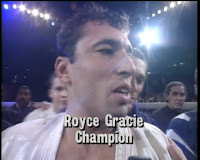 The success of his son Royce in the early UFC is another touchstone, dominating with skill rather than power and overcoming huge size discrepancies. Importantly, he also made a point of winning without unnecessarily hurting his opponents, often opting for a gradual transition to a rear naked choke, without throwing a single punch. When competing, you are unlikely to succeed by staying passive and working your defence. You've got to score points, or even better, force your opponent to give up, which is rarely a gentle process. Neither of you are there to help the other person improve: you are each an obstacle in the other's path to getting that gold medal. Some might argue, justifiably, that aggression has its place in competition. However, examples like Royce feed a desire to succeed through pure technique, smoothly flowing around your opponent rather than savagely cranking your way to a submission. This is especially the case outside of tournaments, when you are in the more co-operative and relaxed class environment. As Saulo Ribeiro said in Jiu Jitsu Revolution, "You have to think that your partner, the guy that you're training [with], has to be your best friend. So, you don't want to hurt him." Nevertheless, there must be a line. I want to perfect my technique rather than beat up my partner, but I also don't want them to flop limply into my submission attempts, or never threaten with any attacks of their own. The extreme end of this paradoxically pacifist approach to martial arts is aikido. There, you can dance your way through crowds of attackers, because they are actively jumping into your throws. A certain amount of resistance is required, or practice becomes meaningless: to paraphrase another of my favourite quotes, you can't learn how to swim without getting in the water. The question is, when does useful resistance cross over into brutish aggression? Aggression is REQUIRED when your time to work is limited. You simply can't flow until your opponent is exhausted and gives up an opportunity when you only have 6-10 minutes to work. And for me the crossover from useful resistance to brutish aggression comes from intent because frankly ALL levels of aggression are useful to me. If my 4 years of training isn't enough to overcome the spastic flailings of an untrained guy 100lbs heavier than I am then I need to re-examine my training, no matter how strong he is. It's only when someone appears to be intentionally trying to harm me in pursuit if the "win" that it crosses the line. Still, I'm more interested in how aggression fits into a class setting. For me, I try to avoid it entirely, as I try to see sparring as a laboratory rather than a battleground. Of course, that doesn't always work so well if your partner has a different perspective, or your ego asserts itself when a big white belt is looking to lock on an Americana. "When does useful resistance cross over into brutish aggression?" I think when you can no longer control the ability to not injure your training partner and/or when the resistance comes at the cost of technique. Nicely put, Jim. Control does seem to be the key word. I guess you could still be aggressive with control, though the 'brutish' part would be up for debate (e.g., perhaps this)? ...just like strength, or raw size, aggression is a tool. It can be the right tool to use to come out on top in a scramble or to seize the initiative for a takedown and playing a top game or to drive you to start escaping before your opponent can settle in to a dominate position. In my opinion, it is the wrong tool to use when finishing a submission or maintaining control in a training situation. I'm always going to finish my subs under control and if the only way I can maintain side control is to "grind" a crossface then I need more work. When rolling, if I'm constantly dominating whoever I'm working with, I usually lighten up so that they can get some offensive work in to. In a true fight, aggression across the board is required, but even then it must be controlled or it will lead to mistakes and poor decisions. I've got some more mindless ramblings here: http://zenmojobjj.blogspot.com/2010/08/tournament-mode-and-killer-instinct.html if anyone is interested. Great article! Definitely something everyone should think about. It's one of those grey areas in BJJ that you kind of need to figure out through your own personal beliefs. It's refreshing to see that other people question what aggression means to them in BJJ. I actually *just* wrote a post on it, because I struggle with it on the mat. You make a lot of great points! Thanks! Thanks Ashley - also cool to see that there are a bunch of related posts on other blogs, such as yours, Leslie, Megan, Georgette and Zen Mojo.